Other features include the staple Wild Symbol. Another is a win-boosting element called Dynamic Symbol Replacement Feature, which transforms random spin outcomes into one-of-a-kind higher paying icons. More opportunities for hitting big wins are available in the Free-Spins Bonus Round, as the bet-free spins are played on reels that exclude the lesser paying A, K, Q, J and 10 symbols. On top of those features are Multipliers that randomly attach to select top paying symbols, which multiply the related rewards if those symbols form winning combinations. A straightforward Wild symbol emerges in any reel, constantly posing as suitable alternative icon for regular-paying identical symbols aligned in the same payline. Yet when three, four, or five WILDs land consecutively in a payline, 25, 150, or 600 coins will be awarded. In the free games, a 5-symbol winning Wild combination awards as many as 750 coins. 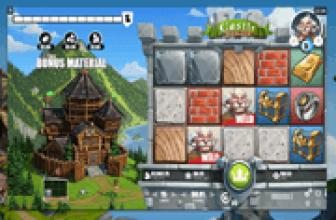 During base and bonus game spins, some symbols such as the Dragon, Fish, Lion, or Phoenix may emerge with a random multiplier of 2x, 3x, or 5x. In the event that an image with a multiplier forms part of a winning arrangement, the corresponding winnings will be paid in fold based on the winning symbol's current multiplier value. Reels 2, 3, 4, and 5 of the base game board are configured with Dynamic Symbol positions. Through this attribute, randomly selected totems transform into identical images. The Dynamic Symbol Replacement Feature initiates by pre-designating a specific top paying icon before a spin launches. Once the reels return after a spin, the Dynamic Symbol positions will then replace all icons in view with images of the pre-selected totem. The feature therefore will fill the reels with numerous identical high-paying symbols that could likely result to multiple payline wins. The Gong Xi Fa Cai greeting, presented in simplified Chinese character, represents the Bonus Game Symbol. It takes positions only in Reels 1, 3, and/or 5. When 3 Bonus Symbols emerge anywhere in any of the designated reels, eight (8) free-spins will be awarded. Another set of eight could be retriggered if the 3-symbol Bonus combination once again occurs as outcome of a bet-free spin. IGT game info states that up to 88 free spins can be activated in a single bonus round. Every bonus spin is optimised as the round is played on a set of reels that contains only the top paying symbols. During the round, the 2x, 3x, and 5x randomly affixed Multipliers will still be in play; making the round as potentially lucrative as the base game reels, despite the disabling of the Dynamic Symbol Replacement Feature. The jackpot game segment is a base game event that may be triggered in any instance that a Multiplier takes position in Reel 1. Once activated arbitrarily, qualifying players are presented with a Red Envelope containing Blue, Red, Green, or Purple Gems. 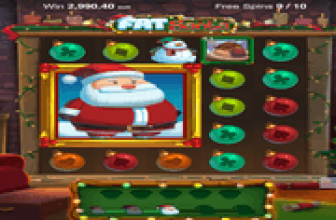 The jackpot play entails collecting 3 same-colored gems in order to win the pooled money corresponding to the gem collection. The Green and Purple Gems award the Minor and Mini Jackpots, respectively. These are progressive jackpots funded by a portion of the bet staked by a single player. The Red and Blue Gems, on the other hand, award the Maxi and Major Jackpots. These are progressively growing prize monies funded by portions of bet staked by all Gong Xi Fa Cai online slot players, pooled via IGT's gaming network. Gong Xi Fa Cai is an IGT online slot in which base game reels are enhanced with Dynamic Symbol Replacement feature to increase odds of reaping rewards via top-paying symbols. In the free round, the reels ensure that winning combos comprise only top paying images, by excluding the lesser paying A, K, Q, J and 10 icons. On top of those base and bonus game elements, the top symbols may emerge with random Multipliers to further increase potential rewards. 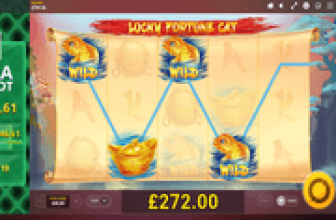 The Multiplier Feature is likewise significant as its emergence could bring around the elements needed to win any of the 4 Lucky Fortune Progressive Jackpots.